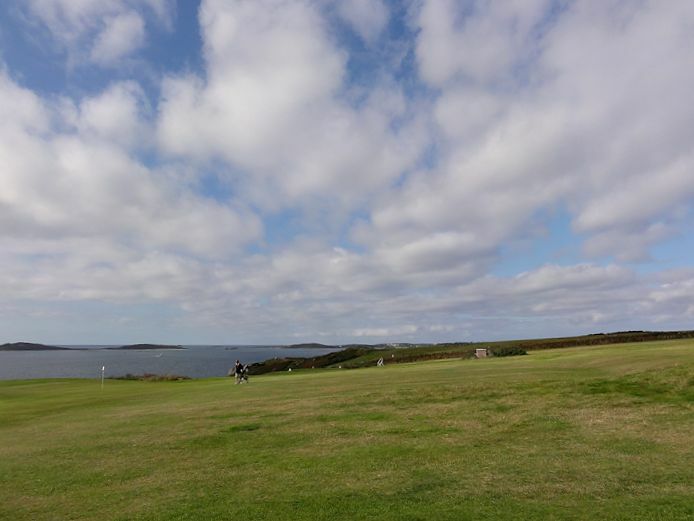 The Isles of Scilly Golf Club is very close to our holiday apartments here at Glandore and, although we’re not golfers ourselves, we are frequent social visitors. In fact, we’ve enjoyed some excellent meals and evenings there courtesy of Ramsey and Faye. In March 2012, when we had our first Painting Week Holiday at Glandore, we chose the Golf Club as the venue for an ‘Icebreaker Dinner’. It gave us a great opportunity to get together with our artist guests, enjoy a fabulous meal and spend a pleasant evening socialising before the start of the week. Everyone agreed that the meal was one of the best they’d ever had – kudos to Ramsey and Faye! 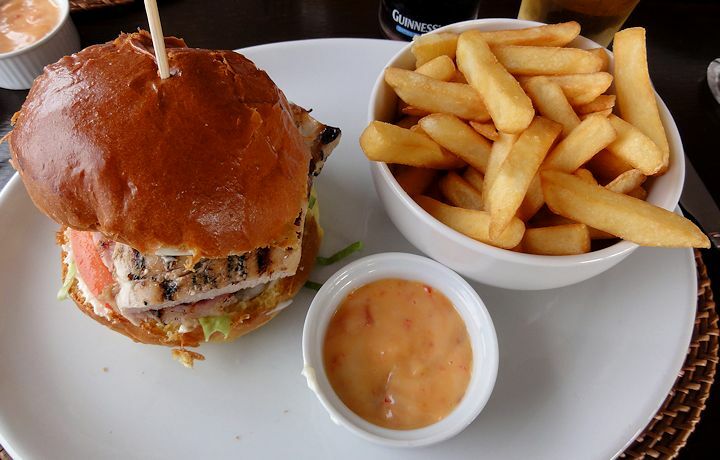 And the food’s not bad either! Being a lovely day, there were a few golfers out on the course while we had lunch. As a bonus, in the evening, the islands enjoyed a wonderful display of ‘crepuscular rays‘. 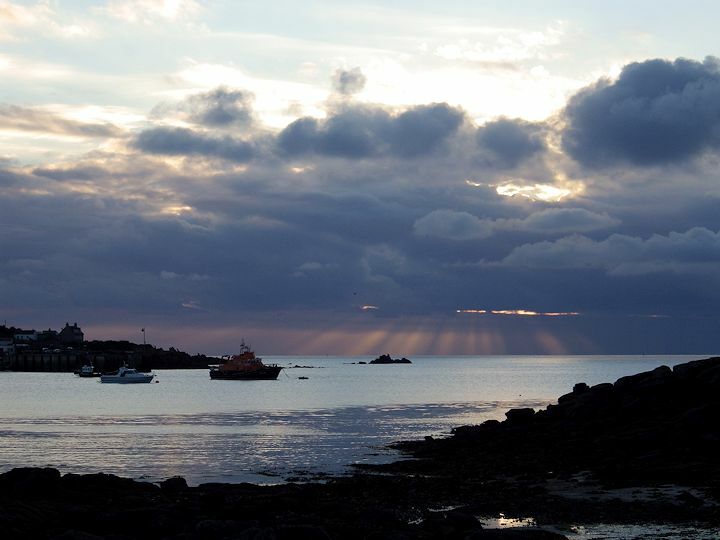 A display of crepuscular rays as the sun set over the St Marys Lifeboat moored in the harbour. 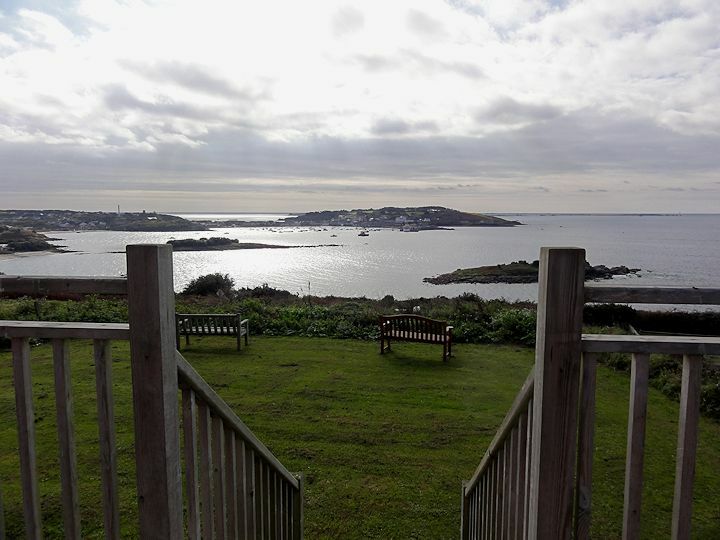 The Isles of Scilly Golf Course is at the top of the hill with amazing views towards Hugh Town and below it nestles the little ‘hamlet’ of Porthloo. The beach itself is one of only fourteen regional subject areas for Quaternary interests within the whole of Great Britain. This is because it is the type locality for a geological feature called the Porthloo Breccia. Breccia is a type of rock composed of larger fragments from either rocks or minerals embedded in very fine ground up crystals. These can be similar or different in composition. This type of rock was found to be the first of its type and so it was named after the place it was discovered in. Porthloo is important for its geological interests. There are Quaternary deposits in the cliff. The organic deposits include pollen which indicates former artic tundra conditions in the palaeoclimate. Isles of Scilly Wildlife Trust – Porthloo, St Marys. Porthloo itself is an interesting, although often missed, place on St Marys. It offers self catering accommodation, Bed & Breakfast accommodation, a cluster of Artists Studios at Porthlo Barn Studios and our own Gallery/Shop at Glandore Gallery as well as Juliet’s Garden Restaurant and the Golf Club.